http://cinziamazzamakeup.com/?x=levitra-20-mg-miglior-prezzo Each potato tuber is a complete package, containing enough water and nutrients to get it off to a good start. It just needs well-drained soil and full sun. Just 1 to 2 inches of water per month between planting and harvest is enough to produce a crop. http://cinziamazzamakeup.com/?x=dove-acquistare-il-levitra You can use any untreated potato to start a new potato plant. Plant potatoes whole if they are small or cut into egg-size chunks if they are large. Before you plant chunks, place the fresh-cut tubers in a dry, shady spot for a few days to allow them to form calluses over the cuts. Uncut seed potatoes will give slightly greater yields than chunks. go site Some people pre-sprout their potatoes, a process called “chitting,” by putting them in a cool, dry and frost-free place for a few days before planting. If you want fewer, bigger potatoes at harvest, then break off all but one or two of these sprouts. For a larger yield of smaller potatoes, do not break off any sprouts. In general, a pound of seed potatoes will produce 15 to 25 pounds of potatoes at harvest. If you plant chunks, then each start will produce around 3 pounds of potatoes. https://24-viagra.com/ There are several basic planting techniques, each with an infinite number of permutations. In row gardens, plant tubers or chunks 4 inches deep and 18 inches apart in rows 2 feet apart. If you prefer to plant in hills, mound soil as you would for squash and plant three or four seed potatoes in each hill. You can also plant potatoes in compost piles or in soil-filled tires. Generally, the more space you give the plants to develop, up to 3 square feet per plant, the higher the yield will be at harvest. Either way, the soil should be well drained and reasonably fertile. Always till well-rotted manure or compost into the ground before planting. 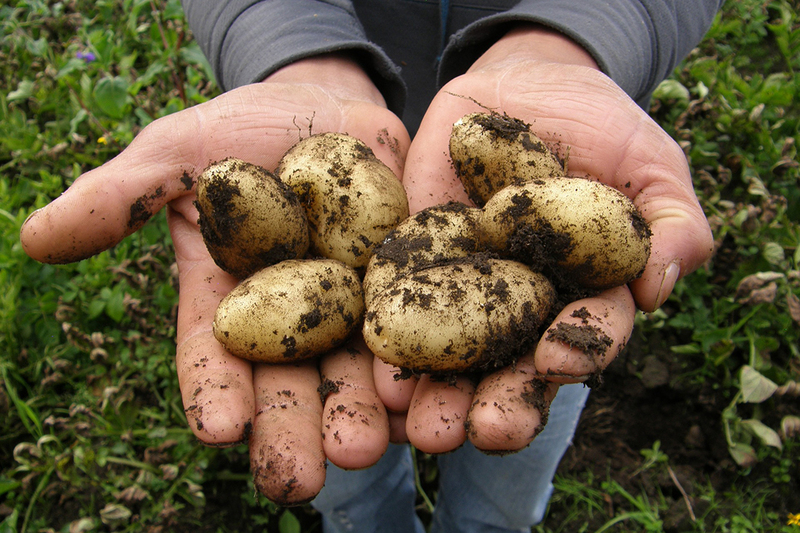 When potato plants reach 4 to 6 inches tall, mound soil up around each plant, leaving about half the top unburied. Do this in the morning, when plants are standing up straight. They sometimes sprawl during the day. Keep hilling plants up until about 8-12 inches of soil covers the seeds. Then, let the plants mature. Flea beetles and wire worms can be a problem. Beneficial Nematodes applied twice in spring will give good results. Be sure to follow instructions. Early morning sprays of insecticidal soap will control adult flea beetles. Gophers can be a problem in some areas. In the worst circumstances, you may have to line the bottom and sides of your planting bed with hardware cloth, or even plant in barrels. You can avoid most disease problems by planting only certified seed potatoes. When plants flower, you can harvest a few new potatoes from around the edge of each plant. New potatoes are not just small potatoes. They are immature spuds whose sugar has not yet converted to starch, as it will in fully developed tubers. That is why new potatoes are deliciously sweet and why they are best when consumed immediately after harvest. After the tops of the plants die down, push a potato fork or a pitchfork into the soil around the perimeter of each plant. Rock it back and forth to break small roots connecting the potatoes. Then, leave the potato patch alone for a week to give the skins a chance to harden up. This way the spuds will not bruise when you dig them up, and they will keep longer.